2016 was pretty great - well, the first 10 months of it anyway! Best of all, though... September's Muskoka River X. 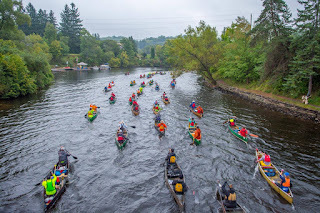 80km of paddling adventure, took us over 12 hours battling through some very beautiful country down the Muskoka River. Challenging and amazing stuff, the cherry on the top of my 2016. But since then it's been rough. November and December especially, I've been fighting some kind of illness/fatigue/pain for 2 months now and I'm very ready for it to go away! To make matters worse I reversed any weight loss I had achieved, back to about 205 pounds after the holidays (vs the ~185lbs I've been holding for years and years). So 2017 leaves me with some work to do, but also a lot of the same cool events to look forward to. Going back to Around the Bay in March for the first time in many years. My 12th (!) Paris to Ancaster... registered and ready to rock. And of course we'll be back at the Muskoka River X - that was just too amazing not to try another kick at it. And some adventure racing and stuff.